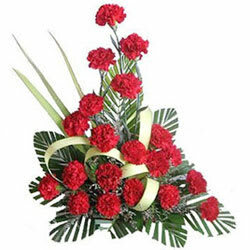 Send this Passionate Full of Love Red Colour Carnations Arrangement to your beloved one as a gift and show your affection. This vibrant arrangement of Flowers exhibit 12 Red Carnations. Flowers Delivery Sivakashi, Send sweets Gulbarga, Wedding Cake Pallakad, Diwali Mithai Vellore, Send Flowers and Gifts to Sirohi, Online Shop Kota, Flower to Ongole, New Year Flowers Valsad , Fresh Fruits Aligarh, Send Gift Ranchi, Dry Fruits to Patna, Birthday Delivery Muzzafarnagar, Sending to Allahabad, Flower shop Mohali, Calcutta Online Cake Delivery.